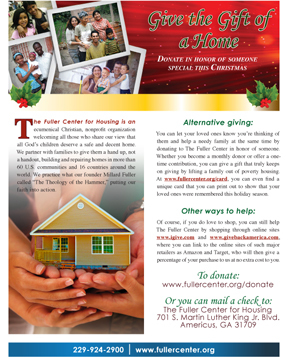 Our graphics guru Richard Aguirre came up with this great flyer to let people know how alternative giving allows you to recognize loved ones this holiday season and help lift families out of poverty housing at the same time. Please consider printing it out and putting up on the bulletin board at your church or office. CLICK HERE TO DOWNLOAD AND PRINT THE FLYER. And don’t forget about our cool alternative giving Christmas card!